Stephen Materne, Maxwell Materne, Dr. Corey Hebert and Zach Materne are pictured at the “New Orleans Distinguished Gentleman’s Ride,” an international event held in over 600 cities in September for men to don their finest garb and ride their motorcycles to raise awareness for men’s health. 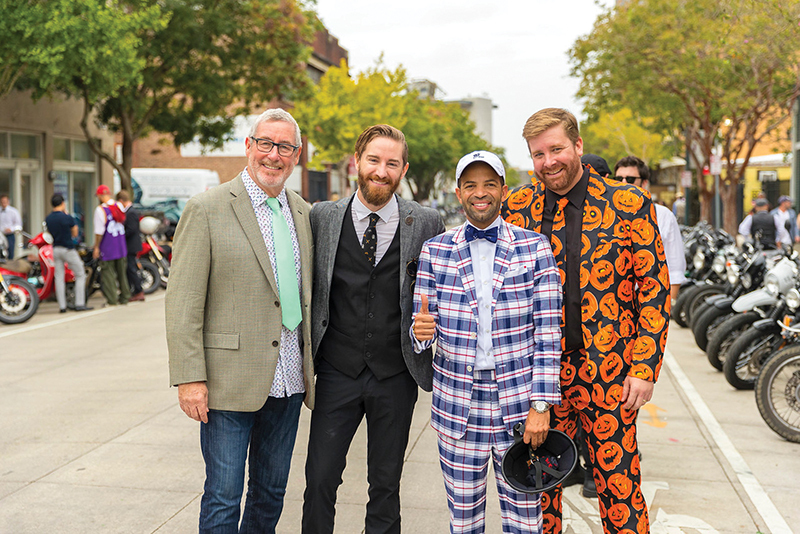 Chris Vatier and Caitlyn Williams show off their threads at the “2018 Distinguished Gentleman’s Ride,” hosted by The Transportation Revolution New Orleans. The event raised over $20,000 in New Orleans and $6 million worldwide for men’s health organizations, specifically those focusing on prostate cancer and mental health. Jodi Poretto and Diane Simoneaux attended the Degas House fall fundraiser “Cocktails in the Courtyard” in October 2018. Michael Liebaert, Kathy Slimp and Degas House owner David Villarrubia posed with Béatrice Germaine, the Consulate General of France in Louisiana, at Degas House and Foundation’s “Cocktails in the Courtyard” fundraiser. Christine Perrin and Andrea Romanos celebrated the 30th annual Bridge House/Grace House benefit “Fore! Recovery Invitational” at English Turn Golf and Country Club on the Westbank in October 2018. Iggie Perrin, Committee Chair, and Else Pedersen, CEO, are pictured at the Bridge House/Grace House’ annual charity golf tournament in October. All proceeds from the invitational benefit the organizations’ treatment programs, which specialize in helping men and women with drug or alcohol dependency lead sober and productive lives. Alyssa Schiaffino, Kelsey Flannery, Jasmine Haralson, Maggie Robert, Alessandra Madrid and April Dupre chose Katie’s Restaurants’ crawfish beignet as their winner at the 2018 Beignet Festival in City Park. Beignet Festival founder Amy Boyle Collins celebrated the festival’s third year with Eleanor Hohnstein and Sarah Hugg Centorino at City Park in October. More than 30,000 people attended the annual event to sample over 30 types of beignets, choosing Ruby Slipper’s cochon as its favorite savory beignet and Luca Eats’ Oreo beignet as its favorite sweet one. The festival benefits the Tres Doux Foundation to support children with Autism. Maryflynn Thomas and Dr. Jane Mill attended the Women’s Guild of New Orleans Opera Association’s masquerade ball in October 2018, “The Haunting Affair,” held at the Guild Home on Prytania Street. Coye Allshouse, Barbara Ballard and Kelley Levy enjoyed a scary-good time at the New Orleans Opera Associations fall fundraiser, “The Haunting Affair,” in October. Phyllis M. Taylor, Ella Cheramie, Marisa Scarlata, Elijah Turk, Kennedi White and Ryan Simien Jr. won The Patrick F. Taylor Foundation’s “18 in ‘18,” a citywide arts competition celebrating high school students and their special connection to the culture of New Orleans. Allison DeBattista, Davis Cole and Austin Martin attended the 2018 Epilepsy Alliance’s second annual gala, “The Soireé,” held at the Audubon Tea Room in October. The event raised over $100,000 to continue to provide services for those in Louisiana facing epilepsy.